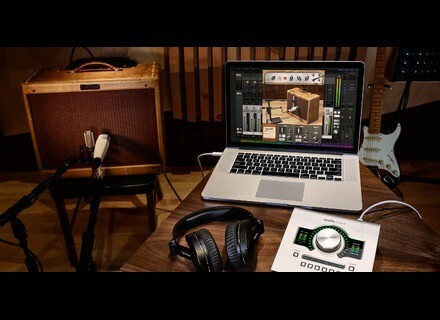 Fender ‘55 Tweed Deluxe Amplifier, Software Amp Simulator from Universal Audio in the UAD Plug-In series. 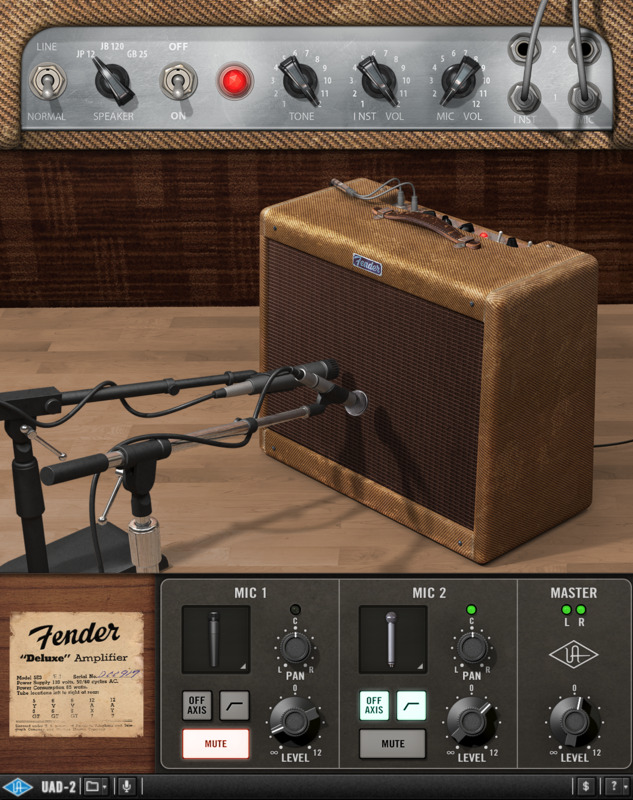 Universal Audio has released plug-ins for quite a few guitar amps in the last couple of years, but its new Fender ’55 Tweed Deluxe is its first foray into the Fender amp world, and it’s a doozy. 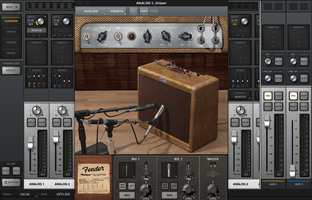 The plug-in, which is officially endorsed by Fender, recreates a mid-‘50s-era Deluxe model 5E3, a vaunted amp that could deliver everything from warm clean tones to creamy smooth distortion. As with any UAD-2 plug-in you need either an Apollo interface or other UAD-2 hardware to run it. Although there are just four front panel knobs and two switches, there’s actually quite a bit of tonal control. You can choose to play through either the Mic or Instrument channels, or both together. Clicking on the inputs changes the patching arrangement, allowing you to alter the tonality. The Inst is brighter and when both are patched in together, you can adjust the balance between the channels using the Inst Vol [volume] and Mic Vol controls. With either channel, lower settings yield cleaner tones and higher setting get progressively more distorted. One of the advantages of a modeled piece of hardware is that the developer can add additional features that weren’t on the original unit. UAD has done just that with the Line/Normal switch. When you switch from Normal (the default) to Line, the level is cut by -14dB, which has the effect of cleaning up the sound pretty significantly. This is important because even with the Inst or Mic volume controls on Low, the amp outputs a fair bit of crunch, especially if your guitar volume is up full. I found Line mode to be really helpful for dialing in clean sounds. The JP12 is the brightest of the three, the Celestion the warmest and fattest, and the JBL is kind of in the middle. The third way to alter the tone is with the Microphone Panel, which gives you two virtual mic positions, each of which can be switched between five different modeled microphones. The mic models, which include Dyn-57 (Shure SM57) Dyn-421 (Sennheiser MD-421), Rib-121 (Royer Labs R-121) and Rib 160 (Beyer-Dynamic M 160), and Con-67 (Neumann U 67). You can set Mic 1 or Mic 2 to any of the models. and switch them between on- and off-axis positioning. You can’t freely move the mics around on the speaker cab or change their distance from the speaker. UAD says that they’ve saved you the trouble of experimenting by placing each mic in its optimal “sweet spot.” While this does restrict your ability to experiment with placement, you can’t argue with success. These mic models sound awesome. Not only that, the accuracy of the modeling is spot on. Each virtual mic also has a Level control, a switchable high-pass filter (which rolls off at 82Hz) and a Mute switch. A master Level knob is also provided, adding additional control. The plug-in opened in the Console application, where you can play directly through it into your DAW. 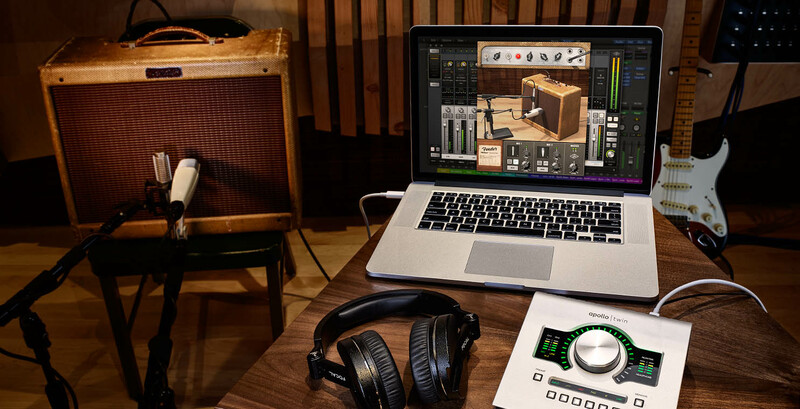 UAD includes 28 presets with the plug-in, some of which are specifically aimed at Strats or Les Pauls. The presets provide you with a good cross section of what the plug-in can do, and are useful as jumping off points for your own settings. Based on my anecdotal observation, it appears that the plug-in is pretty DSP intensive. In my tests, it used up more of my available UAD processing than the other UAD amp models I compared it to, and, more than most of the other UAD plug-ins I tried. That said, it used maybe 8% of an UAD-2 Satellite Thunderbolt Octo, so it’s not problematic to manage. Good as it sounds and feels through the Unison preamp, the plug-in is not to shabby for reamping a DI track. 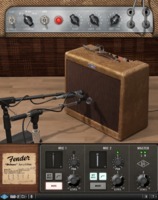 I was really wowed by the Fender ’55 Tweed Deluxe plug-in ($199). 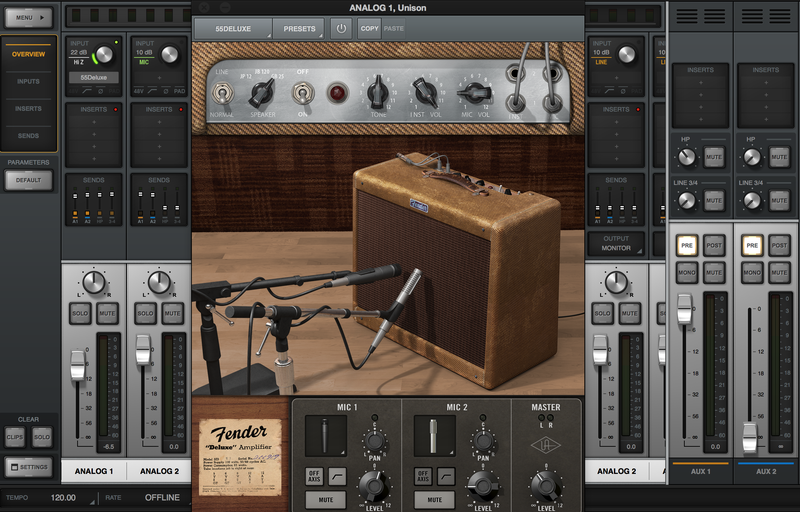 Bearing in mind that my musical taste runs towards the rootsy side of rock as well as to blues and country, I found this to be one of the most satisfying amp modeling plug-ins I’ve ever used (and believe me, I’ve used a lot of them). It felt especially realistic when played through an Apollo interface using the Unison preamp in the Console application, but it also sounded great as an insert in my DAW on DI-recorded tracks. Without question the Fender ’55 Tweed Deluxe is a superb plug-in that brings the sound and feel of a classic amp into your studio.